Recommendation: They are just a Great Service! I'd give them 10 Stars, if I could! I Highly Recommended CFS Fire Protection, Inc.! They are just a Great Service! Their Service Technicians really made the service easy for me. I'd Give them 10 Stars if I could! 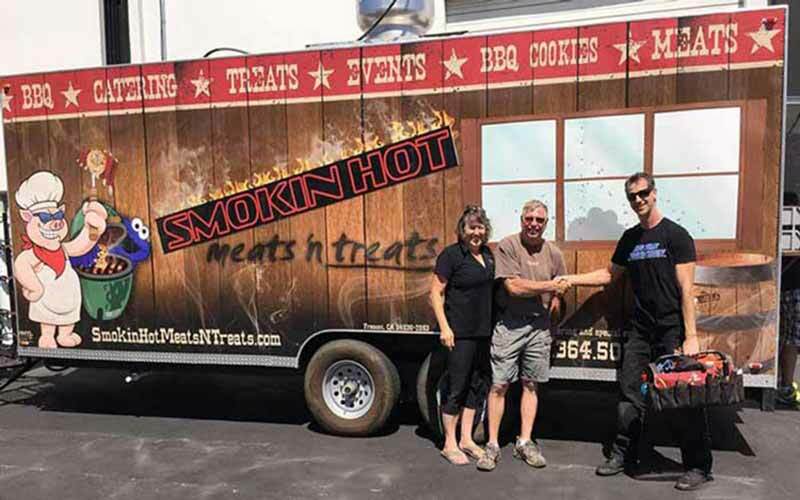 Smokin' Hot Meats 'n Treats is a Mobile Food Truck Service and CFS Fire Protection, Inc. actually met me while I was working out in the City of Dublin where I was at an Event providing my BBQ Foods. The did my Mobile Kitchen Fire Suppression Inspection and Certification right there! They also did our Annual Fire Extinguisher Inspection and Certification Service for us. I Highly Recommended CFS Fire Protection, Inc.! CFS Fire Protection, Inc. Fire Protection Inspection, Installation, Maintenance and Fire Code Compliance Certification Services for Fire Extinguishers, Restaurant Kitchens, Food Trucks, Concession Stands, Fire Hydrants and Commercial Sprinkler Fire Suppression Systems in, near and near by Valley Springs, California 95252. If your Business is located in Valley Springs California and You Need Professional Fire Code Protection, Inspection & Certification Services, Give Us a Call (866) 584-3473. We have all the Fire Protection Services Your Valley Springs Business Needs to Get and Stay Fire Code Compliant!